Final Fantasy VII nearly had a lot more character deaths than Aeris, according to an oral history published on Polygon. 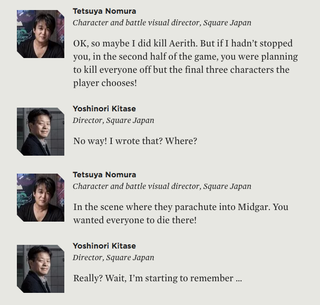 Director Yoshinori Kitase originally planned to kill off most of the party by the end of the game. The piece is an incredibly exhaustive retrospective on the game’s design, featuring interviews with dozens of designers and creatives. I highly recommend it for anyone interested in the series or game history.